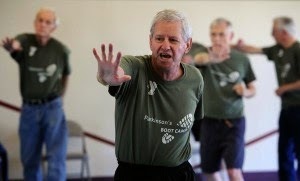 (Diet and Exercise Can Curb the Effects of Parkinson’s Disease, and Promote Overall Immune System Health, by Dr. Mercola) Parkinson’s disease is a neurological disorder in which neurons in dopamine-producing cells within a region of your brain known as the substantia nigra, which is required for normal movement, begin to die. Symptoms, which typically progress over time, include tremors, slow movement, rigid limbs, stooped posture, an inability to move, reduced facial expressions, and a shuffling gait. The condition can also cause depression, dementia, speech impairments, personality changes, and sexual difficulties. The condition affects as many as one million Americans, for whom day-to-day activities can be a real challenge. However, recent research suggests that exercise may be beneficial; improving balance, mobility, and overall quality of life. There appears to be a pronounced toxic influence at work in Parkinson’s disease, which makes dietary considerations all the more important. Nearly a dozen commonly used pesticides have been linked to Parkinson’s, for example, suggesting your best bet is to stick to an organic diet as much as possible. Even ambient exposure to pesticides has been found to increase the risk of Parkinson’s disease considerably, and having a specific genetic variant increases the risk of the disease following pesticide exposure six-fold. Parkinson’s disease is still classified as idiopathic, meaning it has no identifiable cause. But one reason it is likely on the rise is due to many environmental toxins that now bombard your body on a daily basis, with pesticide exposure becoming an undeniable risk factor. Avoiding pesticide exposure – around your home, in your community, and via the food you eat – is clearly important for reducing your Parkinson’s risk, as is reducing your exposure to environmental toxins of all kinds. Another important and often overlooked environmental risk factor is amalgam dental fillings, 50 percent of which is mercury—a known neurotoxin. * Eating an organic, whole food diet…. Generally speaking, you should focus your diet on whole, ideally organic, unprocessed foods that come from healthy, sustainable and preferably local sources. For the highest nutritional benefit, eat a good portion of your food raw. This type of diet will naturally optimize your insulin signaling. Refined sugar and processed fructose in particular can act as a toxin when consumed in excess, driving multiple disease processes in your body – including insulin resistance, diabetes, cardiovascular disease, and systemic inflammation. * Enjoy a comprehensive exercise program. Even if you’re eating the best diet in the world, you still need to exercise—and exercise effectively—if you wish to optimize your health. You should include core-strengthening exercises, strength training, and the right kind of stretching, as well as high-intensity “burst-type” activities. Consider combining this with intermittent fasting to supercharge your metabolism. Also remember that chronic sitting is an independent risk factor for an early demise, so strive to reduce sitting as much as possible. I also recommend walking 7,000-10,000 steps each day, over and above your regular fitness regimen. * Optimize your vitamin D. Researchers report that there is a correlation between insufficient levels of vitamin D and the development of early Parkinson’s disease. The important factor when it comes to vitamin D is your serum level, which should ideally be between 50-70 ng/ml year-round, and the only way to determine this is with a blood test. Sun exposure or a tanning bed is the preferred method, but a vitamin D3 supplement can be used when necessary. If you take supplemental vitamin D, make sure you’re getting enough vitamin K2 and magnesium as well. * Get plenty of animal-based omega-3. Omega-3 fats, such as that found in krill oil, serve an important role in protecting your brain cells. It works in part by preventing the misfolding of a protein resulting from a gene mutation in neurodegenerative diseases like Parkinson’s. * Avoid as many chemicals and toxins as possible. This includes tossing out your toxic household cleaners, soaps, personal hygiene products, air fresheners, bug sprays, pesticides, and insecticides, just to name a few, and replacing them with non-toxic alternatives. An organic diet is the best way to limit exposure to pesticides associated with Parkinson’s disease. Also avoid prescription drugs in favor of more natural approaches, whenever possible.